• Immersive Gameplay & More: Experience the most authentic WWE gameplay ever, featuring thousands of new moves and animations, backstage and in-arena brawling, and the biggest roster of WWE and NXT Superstars and Legends to date. • Powerful Creation Suite: Create and develop your custom WWE with the deepest Creation Suite to date, featuring new creation options such as Create a Video, Create a Victory and a Highlight Replay system. New features and additional content allow you to create the most amazing custom Superstars, Arenas, and Championships. • MyCAREER and WWE Universe with New Promo Engine: The all-new Promo Engine brings the drama and personality of the WWE Superstars to life in MyCAREER and WWE Universe modes. Choose your words wisely and smack talk your opponents, start rivalries or form alliances. Your words will shape your characters as they rise through the ranks of NXT and WWE to become WWE Hall of Famers! Become a Paul Heyman Guy in a new subplot exclusive to WWE 2K17. • Soundtrack by Sean ""Diddy"" Combs aka ""Puff Daddy"": Enjoy a star-studded soundtrack featuring the top names in the music industry, such as Twenty One Pilots, French Montana and Black Sabbath, curated by Executive Soundtrack Producer Sean ""Diddy"" Combs aka ""Puff Daddy""! • Exclusive to PC, the WWE 2K17 PC Standard Edition includes the Goldberg Pack! The annual wrestling game is back and it’s hurtling into the ring of sports games with a refined realistic approach. 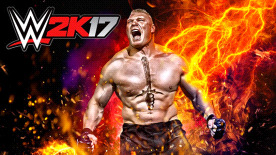 WWE 2K17 delivers with a formulaic and intense wrestling system, which allows you to perform your favourite moves as a wrestling legend. Customisation has come leaps and bounds since last year’s game, with access to shaping your characters visual appearance, speech and choices. WWE 2K17 is fantastically immersive and tones of fun to play, with a showcase of new moves and arenas.